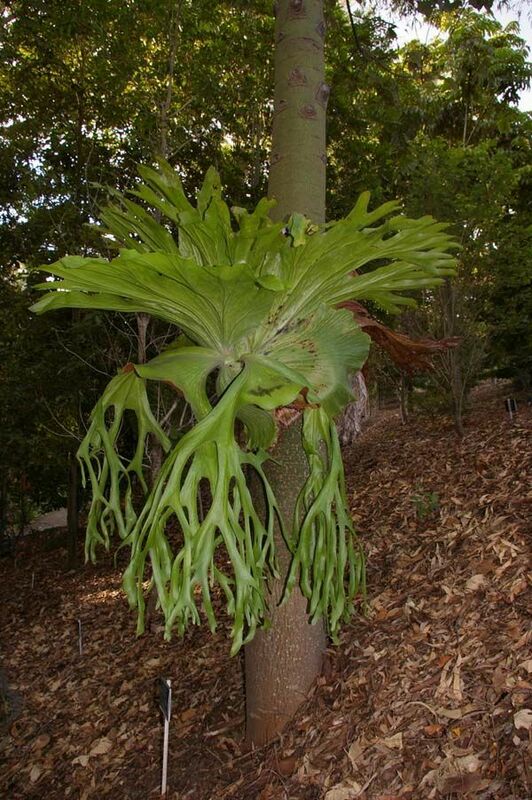 Distribution: Platycerium superbum is native to tropical and subtropical Eastern Australia. It is very similar with Platycerium grande from Philippines which is assumed that was escaping from cultivation into the wild. – Sterile fronds are broad, adpressed to substrate, based round to kidney-shaped, persistent, 120 to 150cm long and 90 to 135cm wide. This fronds are green slowly turning brown with the upper margins fan-shaped, irregularly sinuate or shallowly lobed, rounded to sharp pointed with lobes divided into two parts and elongated reaching forward. The sterile fronds are overlapping and form the basal nest. – Fertile fronds are drooping, usually growing in pairs of equal sizes up to 1m long, narrowly wedge-shaped and tick at bases, broadening upward. Major veins are evident. Sporangia borne in a single semicircular patches on broad, wedge-shaped area of frond extending into sinuses of first fronds forks. Care: Platycerium superbum is a hardy and interesting fern that is grown on trees or walls as a specimen or feature plant. It will establish in 2 to 3 years and is commonly grown around a water feature or used in rainforest setting. It has short creeping rhizomes behind a nest of leaves. The feature fronds are pendulous and the plant is mid green in colour. Ferns require constant moist, well-drained compost but not wet or waterlogged as this promotes rot. Platycerium Superbum like the water to pass by the roots regularly. Platycerium Superbum prefer decomposed organic material. This will improve their growth. Propagation: This specie does not produce offshoots and must be grown from spores. Note: Platycerium genus is form by a group of 15 species from Africa, Madagascar, Asia, Australia, Indonesia, the Philippines and South America. Represented in Hawaii by two naturalized species (Platycerium superbum and Platycerium bifurcatum), both potentially serious invaders of native forests.